One of the big perks of living in Hong Kong is how convenient it is for being able to enjoy a short break in the region. Here are three reasons to consider Yangon in Myanmar for your next getaway. Myanmar National Airlines flies to Yangon from Hong Kong four times a week on Mondays, Wednesdays, Fridays and Sundays. The flights leave in the mid-afternoon meaning you arrive at the perfect time to get in the holiday mood with some dinner or drinks when you reach Yangon! If you’re not familiar with Myanmar National Airlines, the national carrier has been in operation since 1948. Myanmar National Airlines Chief Executive Officer Captain Than Tun said the airline upgraded its domestic service just a few years ago, and offers state-of-the- art reservations and airport systems, and upgraded food and inflight services through its fleet of aircraft. Mynamar National Airlines Chief Commercial Officer Naing Saw Lwin said Business Class guests will enjoy 43 inches of legroom, in-flight entertainment, complimentary priority check-in and boarding, fast-track immigration and security, and even an on-request limo service to and from Yangon City. Premium Economy guests also get priority check-in and boarding. Myanmar National Airlines offers complimentary food and drink on all flights, and in-flight entertainment which can be streamed via app to your devices on the 737-800s airplanes. In other words, your holiday begins as soon as you take your seat on the flight! The former capital is Myanmar’s spiritual core. It was founded in the 11th century under the name of Dagon, before being re-named Yangon in 1755. It served as capital city from 1948 until the government relocated the capital to Naypyidaw in 2006. The mix of colonial architecture, modern high-rises and gilded Buddhist pagodas define Yangon’s skyline. 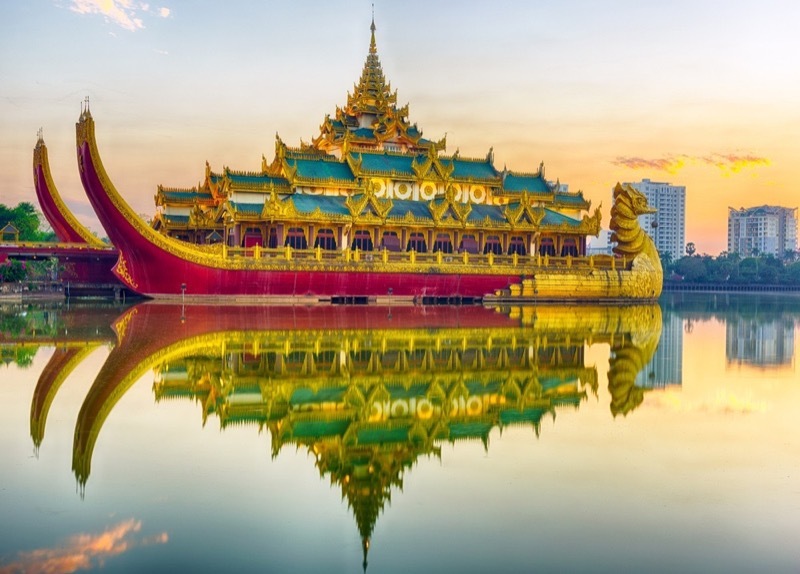 As the country’s largest city – around six million people – Yangon continues to attract big tourist numbers, and it’s also the most important commercial and logistical hub in Myanmar. Hotel numbers continue to grow in Yangon, including luxury offerings like The Peninsula, currently under construction. There’s plenty to do if you are in Yangon for a short break. The famed Shwedagon Paya is a huge shimmering pagoda complex that draws thousands of pilgrims annually. The city’s other notable religious sites include the Botataung and Sule pagodas, both housing Buddhist relics, as well as the reclining Buddha of Chaukhtatgyi Paya. Other tourist highlights include the Bogyoke Aung San Market for gems and traditional handicraft, and the upmarket mall, Sule Square Shopping Centre. You’ll also want to check out the night market along Strand Street and China Town for some memorable street food. A visit to Kandawgyi Lake lets you marvel at the spectacle of the famous Karawei Barge on the eastern shore. And kids and the young at heart will enjoy a visit to the modern Yangon Water Boom theme park. This article was brought to you by Myanmar National Airlines. Love dining out? Check out our guide to Hong Kong restaurants!